A View from Above is a lovely cabin nestled in the beautiful mountains of Sautee Nacoochee Georgia. This cabin has wonderful amenities for you to enjoy on your stay. 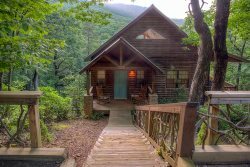 It’s a three bedroom cabin with two bathrooms and sleeps up to six people and also PET FRIENDLY. Enjoy an open floor plan that is perfect for gathering friends and family. The living area has a wood burning fireplace with a flat screen TV above it and a pool table for maximum enjoyment. 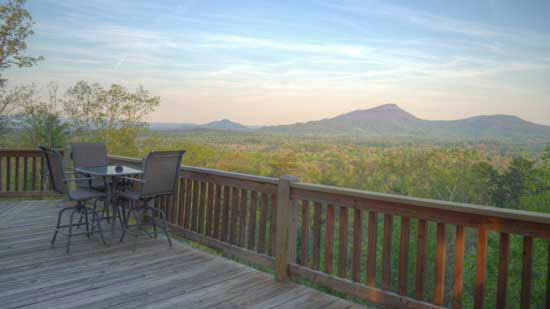 Another amazing feature of a view from above is the screened in porch with a hot tub! Here you can enjoy the outdoors and the views without the worries of beautiful Mother Nature. The master bedroom has a king size bed and a flat screen TV while the other two rooms have a king size bed and queen size bed. If you’re still looking for more reasons to love a view from above then you’re in luck. Just out back of the cabin sits a beautiful fire pit with amazing views and a charcoal grill, Making it the perfect way to end the day. A View From Above is approximately 7.5 miles from Helen! The cabin was very clean. It has comfortable beds & a great shower. The view from the hot tub was amazing! Plenty of dishes in cupboard. My friend and I typically stay Thurs.-Sunday, but this year were able to get away for an entire WEEK - and wouldn't have wanted to stay anywhere else:):) It's secluded and that's what we like. It's quaint and that's what we have always looked for. It's clean, very move-in ready and has NEVER disappointed. The staff was very helpful & friendly. The cabin was very clean and beautiful. Very relaxing. I did not have to personally interact with members of your team becsuse the automated processes and procedures were set up so well that it was not necessary. Thoroughly enjoyed our stay at the cabin. The team members we worked with we're always helpful and responsive to our questions. Highly recommended to all my friends and coworkers. Perfect vacation rental and family outing experience. Only had oine phone interaction that was positive. The property was beautiful. We loved our stay there. It was better then expected. We would definitely stay again. I love the views, the cabin is so beautiful, i had a wonderful time there with my family. The staff made it extremely easy in making the reservation and securing our rental. Every question was answered almost before we had to ask. It was fantastic! Beautiful cabin, peaceful and close enough to go to Helen whenever we wanted. Everything was great! Staff answered emails promptly and with clarity. The cabin was much more than what we expected. Cleanliness was outstanding. Everything was easy to find. We loved the view and the quality of the surroundings. Grounds are exceptionally well kept. Will definitely return! The whole experience is very easy online to set up. This is our second time and we will be sure to use you again.